In some ways, my journey of faith began before I was born. My mother has always told me that I was happiest in the womb when we were in worship. I grew up the daughter of a minister. And though I never expected it, I became a minister myself. All of my life I have heard the stories of Jesus and been surrounded by conversations of faith. And the most wonderful thing, is that ever since that moment, God has been leading me. Some of the places He has lead me have been unexpected, some of them have been difficult. But most of them have been absolutely wonderful. And I wouldn’t give back one single step of the journey. 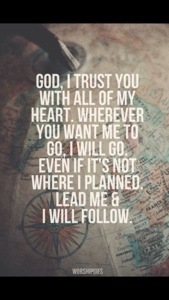 May you pray a prayer like this one. May you know what it is to follow God into unexpected places and discover things about Him and about yourself – bout the person He made you to be. And may you know that because God is leading you, you need never regret one single step of the journey.